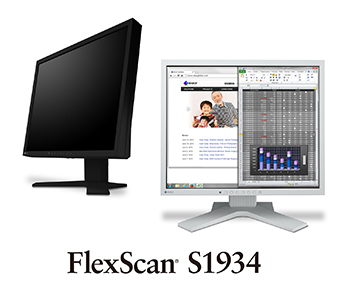 Hakusan, Japan, June 23, 2016 – EIZO Corporation (TSE: 6737) today announced the release of the FlexScan S1934, a 19-inch monitor with a 1280 x 1024 native resolution for offices and control rooms that require a traditional square format. The FlexScan S1934 is the successor to the FlexScan S1933. A DisplayPort input has been added to provide long-term support after a system upgrade. Power consumption is just nine watts during typical operation which is a 25% reduction over the FlexScan S1933. The FlexScan S1934 features an IPS (in-plane switching) LCD panel with a wide 178° viewing angle that minimizes color shift and contrast changes when viewing the screen at an angle. An ambient brightness sensor called Auto EcoView adjusts the monitor’s brightness in accordance with changes in the ambient brightness. A preset mode called Paper mode lowers color temperature to reduce the blue light output which can cause eye fatigue. A non-glare screen reduces eye fatigue by dissipating reflective light that otherwise makes the screen difficult to view. Furthermore, the surface of the bezels is treated to prevent light reflection. The FlexScan S1934 also comes with sRGB, DICOM (for viewing medical images) and Custom (user-defined settings) preset modes. The user can toggle between modes by pressing a button on the front bezel. An ergonomic stand with 100 mm height adjustment, 30° tilt, 70° swivel, and portrait-mode viewing. A basic stand with 30° tilt only is also available as an option. The FlexScan S1934 is now shipping. Date of availability varies so please contact the EIZO group company or distributor in your country for details.